City of San Francisco and its Vicinity California. 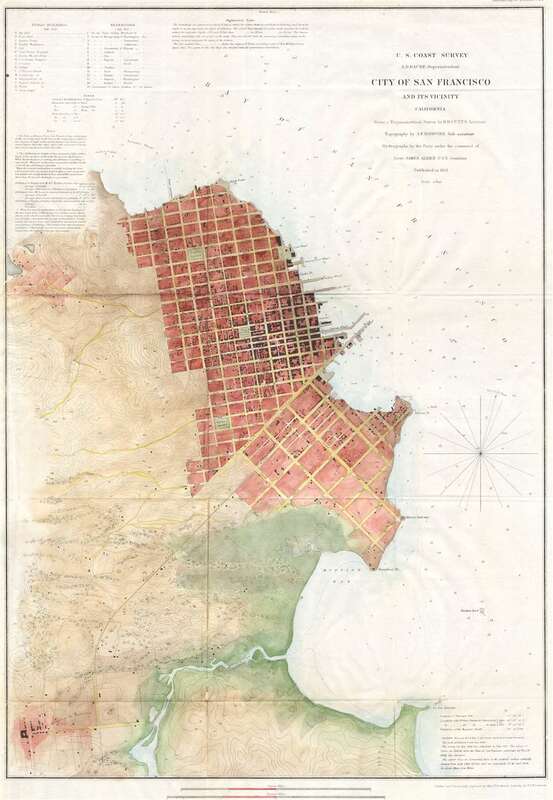 A rare coastal chart of San Francisco by the U. S. Coast Survey, 1853. Depicts the immediate city of San Francisco and surrounding areas as far as the Mission de Dolores or the Mission de San Francisco. Issued shortly following the gold rush, this early map depicts the city extending only about 8 city blocks from the waterfront. Labels piers, wharfs, parks and roads as well as indicating important individual buildings such as the City Hall, the Post Office, hospitals, and churches. The ocean areas have detailed depth soundings. Text on public buildings, reservoirs, sailing notes, shoals, and tidal notations are included on the top left and lower right hand corners of the map. This map is the second state of the 1853 edition. The first edition, in 1862 lacked depth soundings. Varies from the first 1853 state in the additional of tidal information in the upper left and corrections in the naming of the wharves and piers. Rumsey suggests that the actual city plan was taken from an earlier map produced Cook and Le Count. The interior topography comes from the Eddy map. Varies from the first state in the additional of tidal information in the upper right and corrections in the naming of the wharves and piers. The original trigonometrical survey for this map was prepared by R. D. Cutts. The topography was accomplished by A. F. Rodgers and the hydrography by James Alden. All work was produced under the supervision of A. D. Bache, one of the most influential superintendents in the history of the U.S. Coast Survey. Very Good condition. Professionally cleaned, flattened, and backed with archival paper. Blank on verso. Minor buckling of paper. Contemporary color. Wide margins. Vogdes, Anthony W. A bibliography relating to the geology, paleontology and mineral resources of California, Sacramento: A.J. Johnson, 1896, p 253; Rumsey 3463.000; Phillips, Philip Lee. A List of Maps of America in the Library of Congress, p. 780.